¡Buenas! It’s Abi and Rachel here! Today was quite the adventure. It began with an early morning wake up call, a cup of coffee, and breakfast at the hostel. Then we all piled into the bus to head to our first class of the day with the Gramo Danse company. After a long drive through rush hour traffic we arrived at the studio. It was an awesome experience to take a class with the professional dancers here taught by our very own Jennifer Weber. It was so interesting to see the joy of movement between everyone in the class as we did a combination of ballet, modern, and improv. As the class went on we could see the relationships that were starting to form and how dance was overcoming the language barrier between us. 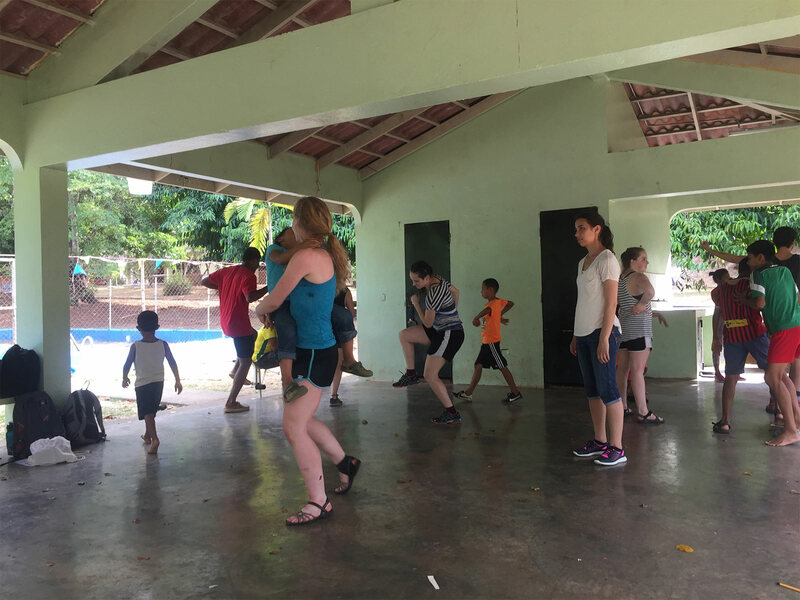 Covered in sweat and filled with the peaceful exhaustion that comes with taking a good class, we piled back onto the bus to head to Panama Viejo. hat used to be. Later, we discovered an active dig, where archaeologists were uncovering more human remains; it was exciting to see the continuing process of uncovering and restoring the past. It was unfortunately time to go, so back on the bus we went. After a brief lunch of pig’s feet and other Panamanian food, it was time to go teach. Natalie and her assistant Molly went to the National Dance school to teach an intro to modern dance class, while the rest of us headed to Aldea SOS, an orphanage just outside of the city. Brianna taught an improvisation based classed to the older students; they played with positive and negative space, showcasing movement to each other. At the same time, Nicholas taught the younger kids (ages under 10) with an combination of fun games, such an animal parade, freeze dance, who started the motion, and pato pato ganzo (duck duck goose). One of the most memorable moments was when Nicholas asked us to pretend to be un elefante flaco (a skinny elephant). Not only was this a challenging task, but we were informed by the kids that skinny elephants do not, in fact, exist. Both classes were a success and it was beautiful to see the kids in motion and the dance that so easily emerges from their bodies. After a mini dance party and playing with the kids it was time to go. Later during the day it was a time for reflections to acknowledge the challenges and recognize the diversity and unity we had experienced throughout the entire day.